Planning a successful family reunion may seem like an easy task, but a typical family reunion will assemble hundreds of family members from the eldest to the youngest for a meal, some fun and discussion. The older attendees are generally grandparents, parents, siblings or first cousins while the youngest could be second, third or even fourth cousins. It’s also not uncommon for regular family reunions to be sponsored by family organizations or family associations centered around common family member celebration or ancestor. For some, receiving an invitation to a family reunion is exciting. For others, the same invite can trigger a headache. But what if you’re in charge of planning your family reunion? Do you know what to do? 2. Pick the date. It’s not a successful reunion if no one can attend. You may want to plan your family reunion to coincide with an elder family member’s birthday or a national holiday. Pick two or three dates and poll family members to avoid time and date conflicts. Most importantly, remember that you won’t be able to please everyone. Choose your final date based on what works for most of the family members. 3. Select a location. Try to select a family reunion location that is most accessible and affordable to most of the family members. If relatives are living one area, then select a reunion location that’s nearby. If everyone’s located all over the country, then try to pick a central location to help cut down on travel expenses. 4. Develop a budget. This will help you decide the type of the food, decorations, accommodations and activities for your family reunion. You can choose to pay for all this out of your own pocket with the hope that family members will contribute; but unless you have a money tree in your backyard, you should collect a pre-registration fee to help with t-shirts, decorations, catering, activities and location costs. 5. What about a theme? 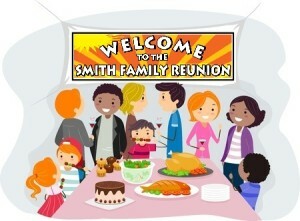 Creating a theme for a family reunion is a fun way to attract family members and make them more likely to attend. It also makes things more exciting! When it comes to planning a successful family reunion, be imaginative with the t-shirts, food, games, activities, invitations and just about every other aspect of the reunion. Family history themes are very popular, as well as celebrating family member’s birthday or anniversary, or your family’s heritage. 6. Determine the menu. Feeding a large group of people with different tastes is one of the trickiest parts of planning a reunion. Make it easier by choosing a menu that relates to your theme, or maybe a menu that celebrates your family’s heritage. If you are a tight budget, organize a group of family members to prepare the food. If you have a large group and your budget allows, find a caterer or restaurant to do at least some of the work for you. Fabulous food makes for a family reunion that everyone will remember. 7. Plan some fun activities. Planned activities at your family reunion will help provide a comfortable atmosphere so people who do not know each other well will have fun and get together. Create activities that will be fun for all ages and help promote family knowledge and heritage. You may also want to prizes or special gift awards for the oldest family member or the longest distance traveled to attend the reunion. 8. Set the stage. You’ve got a bunch of people, now what do you plan to do with them? It’s time now to make arrangements for tents (if an outside reunion), chairs, parking decorations, programs, signs, t-shirts, goodie bags and other reunion-day requirements. 9. A picture says a thousand words. While many family members will no doubt bring their own cameras, it helps to also make plans to record the family reunion. Whether you designate a certain family member as the official reunion picture taker, or hire a professional photographer to take photos or videos, you should prepare a list of the people and events that you want recorded. For spontaneous “moments,” purchase some disposable cameras and hand them out to relatives. Don’t forget to collect them at the end of the day! 10. Print up a program Create and have a program printed that outlines the lineup of scheduled reunion events to provide to family members as they arrive for the reunion. You may also want to send this out via email or your reunion Web site in advance of the reunion as well. This will help serve as a reminder to people of activities which may require they bring something with them, such as a photo wall or family tree chart. 11. Decorate for the big day. The big day is almost here and now it’s time to make sure it goes smoothly. Create catchy, easy-to-ready signs to point arriving guests to registration, parking, and important locations such as bathrooms. Purchase or make a guest book to collect signatures, addresses, and other important information, as well as serve as a permanent record of the reunion. Purchase custom made name badges with lanyards to facilitate mixing and mingling between unacquainted family members. Family tree wall charts are always a big hit as reunion attendees always want to know where they fit in to the family. Framed photos or printed posters of common ancestors or past family reunions are also popular. And, if you want to know what everyone thought of all your reunion planning, print up some evaluation forms for people to fill out as they leave. 12. Keep the fun going. Designate a volunteer or volunteers to create and send out a post-reunion newsletter with stories, photos and news items from the reunion. If you collected family information, send along an updated genealogy chart as well. This is a great way to get people excited about the next reunion, as well as include less fortunate family members who were not able to attend. Posted in Event Planning and tagged family reunion, family reunion gifts, family reunion invitations, family reunion planning, family reunion t-shirts, t-shirts. Subscribe to the Spotlight Apparel news letter below and you'll be the first to hear about news, events, specials, limited-time offers and more. Copyright 2014 - 2018 Spotlight Apparel, Inc.